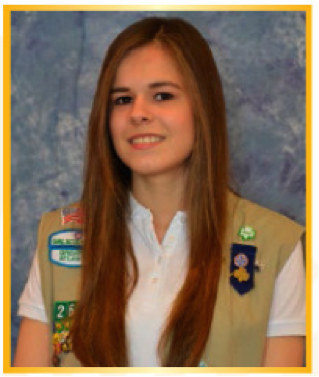 Every year, ten exceptionally inspiring Girl Scout Gold Award recipients are chosen as Council Young Women of Distinction (CYWOD). 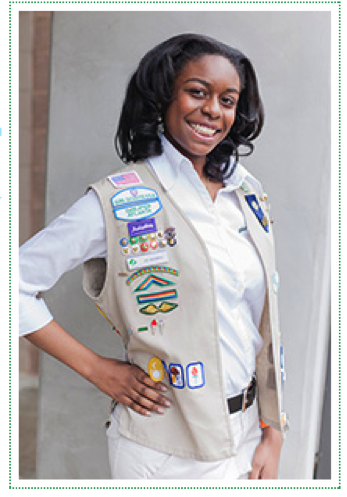 This honor is given to Girl Scout Seniors and Ambassadors whose Gold Award projects demonstrated extraordinary leadership, had a measurable and sustainable impact, and addressed a local challenge related to a national and/or global issue. These young women are taking matters into their own hands, generating much-needed change! The CYWOD program perfectly reflects our mission of building girls of courage, confidence, and character who make the world a better place. The program provides these young stars with the opportunity to inspire girls around the world and throughout the Girl Scout Movement—and serve as incredible examples of what it means to be a G.I.R.L. GSGATL congratulates Sarah Schurr—2015 Council Young Woman of Distinction. ​Sarah's project focused on providing useful tips and techniques to help professional and familial caregivers better communicate with elders suffering from dementia, Alzheimer's, or social detachment, and it had three parts—an educational booklet, a toolkit, and a website. This project was inspired by Sarah's personal experience watching her extended family struggle as her grandmother demonstrated signs of dementia. By consolidating information on the sensory changes that come with aging and detailing techniques for facilitating meaningful communication, Sarah hoped to build others' understanding of the physical changes elders face and help them more effectively connect with those suffering from or at risk for social detachment. Along with a copy of her booklet, her toolkits—called "Talk to Me" treasure boxes—hold resources such as sensory mats, conversation starter cards, and photo albums, each designed to begin and sustain conversation. The finished boxes were donated to a local hospital and multiple assisted living centers. ​GSGATL congratulates Zoë's Gadegbeku—2013 Council Young Woman of Distinction. Increasing the knowledge and level of interest of high school young women towards STEM Careers is Zoë's passion. Zoe created The W.I.S.H. Careers Network for High School Girls. The project is three-fold with career seminars, the W.I.S.H. careers website, and the W.I.S.H. science clubs. The Network's impact will be sustained through the W.I.S.H Science clubs, website and seminars and continued partnerships with key organizations like the NSTA. W.I.S.H. in a Box guides educators and girls through hosting their own event.